You may wish to Import a Region whose rhythm doesn't quite fit the Session you are working on. 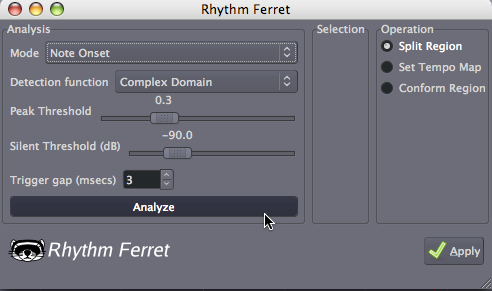 Luckily, Ardour contains a tool for analyzing the rhythm of a Region called the Rhythm Ferret. 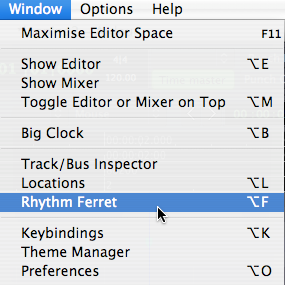 You can load this tool by selecting a Region and clicking Window > Rhythm Ferret from the main menu. The Rhythm Ferret has two modes. One is for locating the Note Onset (the starting point of a change in pitch in the Region). However, here we will use the other mode—the Percussive Onset mode—which looks for sharp changes in volume in the Region. Click Analyze to analyze the Region. Experimenting with the Threshold and Sensitivity controls can help when analyzing a complex Region. Once the Rhythm Ferret has analyzed the section, it will suggest some places where it has found sharp changes in volume. If you select the Split Region Operation, it will Split the Region into new, smaller Regions based on the changes in volume that it has found. Next, you can use the Move and Shrink/Stretch tools, combined with the Grid and Grid Points set to a reasonable division, such as Beats/4, to adjust the length and location of each smaller Region. When you are done, the divisions of the original Region should fit the rhythm of the passage we have been working on. Once you have composed a short passage which you like, you will have reached the end of the Editing Sessions tutorials. Please continue to the next section on Mixing Sessions to learn about Mixing, Panning and using Plugins to improve the sound of your composition.